Grade 2 Hex Cap Screws are made from low to medium carbon AISI 1006-1050 equivalent steel. 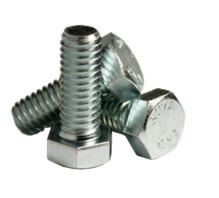 They are an externally threaded screw starting in 1/4" diameter with a trimmed head, a washer face on the bearing surface, and a chamferred point. Grade 2 hex cap screws are economical and generally used in non-critical applications where the fastener is not subject to extreme temperatures or stress.